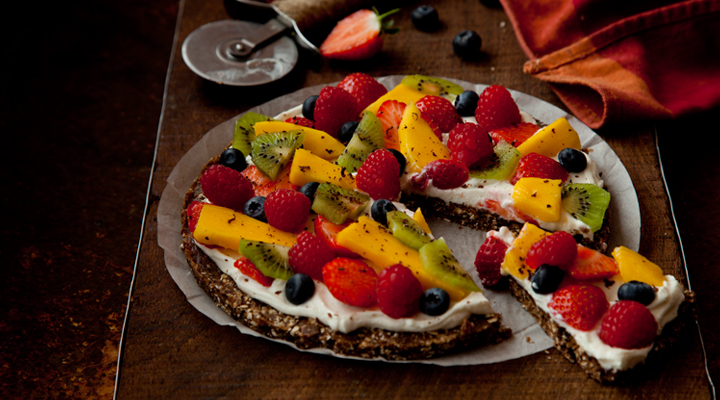 This fun take on a pizza is a great way to get kids involved with cooking while getting fruit into them. This recipe makes 2 X 20cm pizzas. Grease the base of the 2 x 20cm round, loose-bottomed tins with sunflower oil and line with a disc of non-stick baking paper. Blend the dates in a food processor to make a fairly smooth paste. Add the chocolate, oats and peanut butter. Blitz everything together until you have a chunky paste. Divide the mixture evenly between the tins and press it down to make a smooth, level base. Cover with cling film and chill in the fridge for about 2 hours, until set firm. Alternatively, this will take half the time in the freezer. The base can be made up to a week in advance. Meanwhile, spoon the ricotta and yogurt into a medium bowl and whisk until smooth. Split the vanilla pod in half, scrape out the seeds and add them to the bowl. Alternatively, add the vanilla extract. Cover and pop in the fridge until ready to serve. Once the base is set and you're ready to serve, remove the bases from their tins, discarding the paper. Place on serving plates or boards and spread the ricotta yogurt evenly over the tops. Arrange your chosen fruit however you like on top, either in a fancy pattern or simply scattered over evenly. Scatter over the mint, if using. Cut into wedges and serve. While this pizza might be full of wholesome ingredients, don't forget that it is still a dessert and should be enjoyed as a treat at the end of a hard week.